Attractive vintage retro satinwood chest of five drawers. A lovely retro satinwood chest of drawers. We date this chest of drawers to the 1960/70's. The chest of drawers sits on four circular section downward tapered splayed legs. The main chest consists of a bank of five graduated drawers. 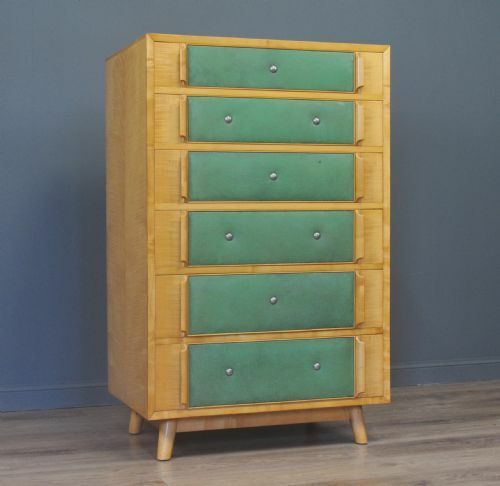 The drawers are fitted with shapely stand out wood handles and the drawer fronts have been lined in green leather with stud detail. The chest of drawers has an overall height of 48.5" (123cm), a width of 30" (77cm) and a depth of 21" (53cm). This lovely retro chest of drawers remains in very good solid condition with only very minor surface markings commensurate with age and usage, including some minor wear to the finish to the top surface and the bottom right drawer handle has been repaired at some point in the past. When looking from certain angles against the light it is possible to see an old doily mark to the top surface. This remains a very stylish and elegant retro chest of drawers which will continue to provide good service for many years to come. Attractive large retro 1970's Rosewood 'Meredew' sideboard cabinet. 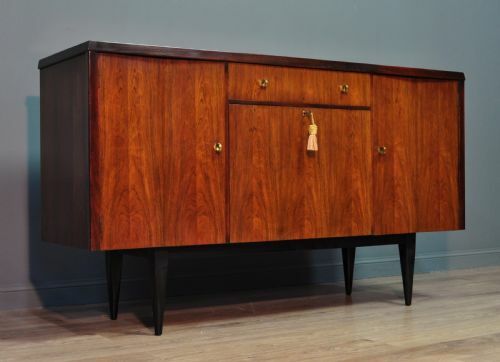 A lovely retro rosewood sideboard. We date this sideboard to the 1960/70's. There is an 'Meredew' plaque inside the drawers at the rear. The sideboard sits on four oblong section legs which taper down at the base. The main cabinet consists of a drop down cupboard below a drawer in the centre flanked by a cupboard to each side. The drawers and doors are fitted with shapely ring handles and the doors have an attractive concave design. The interior of the outer cupboards are fitted with two removable shelves. The top drawer has a sliding removable silverware tray and the lower cupboard is fitted with a removable half depth shelf. The drop down door has a lock fitted (key supplied). The sideboard has a height of 35.5" (90cm) with a width of 61" (155cm) and a depth of 18.5" (47cm). 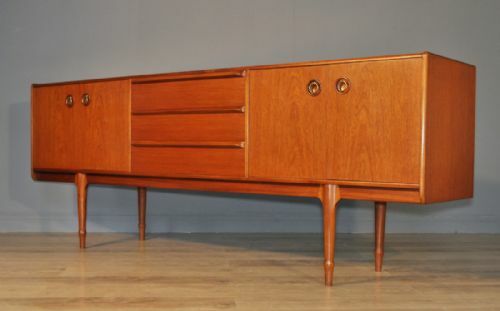 This lovely retro sideboard has been constructed to a high standard and remains in very good solid condition with only very minor surface markings commensurate with age and usage, including some minor surface marks, scratches and indentations from past use, primarily to the top surface and edges. This remains a very stylish and elegant retro sideboard which will continue to provide sterling service for many years to come. A lovely retro wardrobe. We date this wardrobe to the 1960/70's. The wardrobe sits four small downward tapered legs. The front of the wardrobe is of a single panel design with the panel being a side hinged door. The door is fitted with a vertically mounted wooden handle. The door is also fitted with a catch. The front of the door has large green leather insert with studded decoration. The interior of the wardrobe is fitted with a side to side hanging rail and a shelf to the top. There is a full length mirror to the inside of the door. The wardrobe has a height of 71.5" (182cm), a width of 36" (92cm) and a depth of 21.5" (55cm). This lovely wardrobe remains in good condition with some minor surface markings commensurate with age and usage. There are also a few light scratches and indentations to the finish and there is a slightly worn area to the finish on the outer right hand side about a third up from the base. This remains a very stylish and elegant wardrobe which will continue to provide sterling service for many years to come. 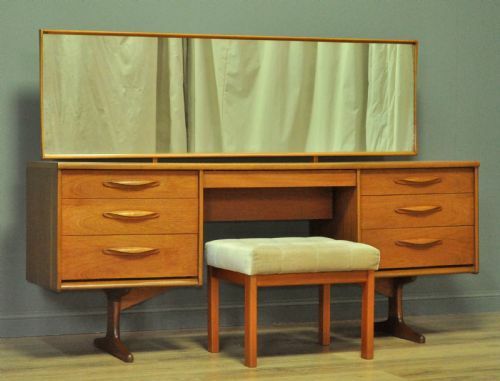 Attractive retro 1960/70's satinwood dressing table and stool. 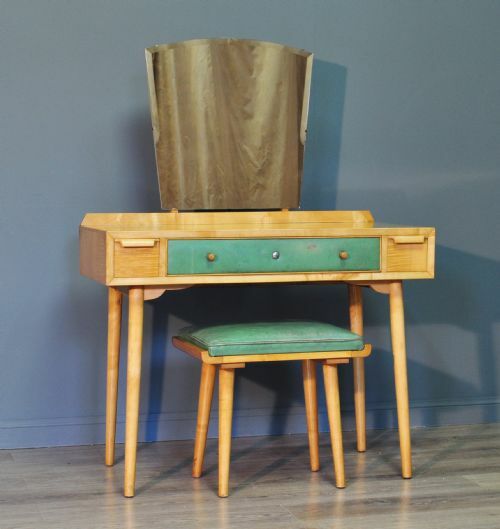 A lovely retro satinwood dressing table with stool. We date this dressing table to the 1960/70's. The table is fitted with a shapely central mirror. The mirror glass is thick and is showing little signs of foxing. The body is of a three drawer design, the central drawer has a green leather insert with stud detail. There are two smaller drawers flanking the central drawer. The dressing table sits on downward tapered splayed legs. The drawers are fitted with wooden handles. The stool has a similar design to the dressing table and features a green leather padded top. The dressing table has a height of 53.5" (136cm) (including mirror) with a main table height of 30" (76cm), a width of 39" (99cm) and a depth of 20" (51cm). This lovely retro dressing table has been constructed to a high standard and remains in very good solid condition with only very minor surface markings commensurate with age and usage. The top surface has a few minor marks, scratches and wear to the finish, when looking at it in some angles, you can see some old doily marks. The stool pad has some minor usage marks. This remains a very stylish and elegant retro dressing table and stool. It will continue to provide sterling service for many years to come. Attractive vintage retro teak chest of six drawers. A lovely retro teak chest of drawers. 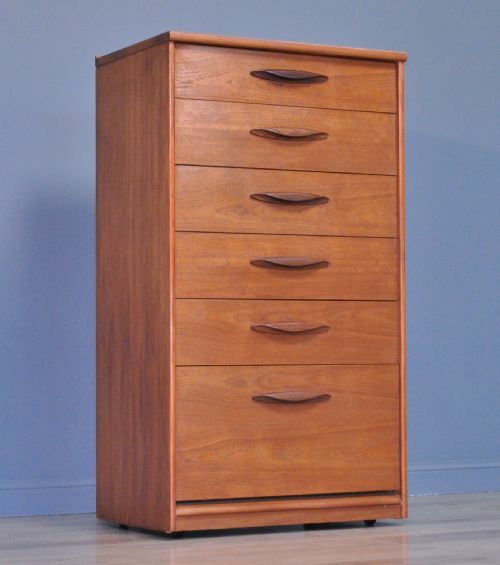 We date this chest of drawers to the around the 1960/70s. The chest of drawers sits on four recessed castors. The main chest consists of a bank of six graduated drawers. The drawers are fitted with horizontally mounted wood stand out handles. The chest of drawers has an overall height of 45.5" (116cm), a width of 25.5" (65cm) and a depth of 17" (43cm). This lovely retro teak chest of drawers remains in very good solid condition with only very minor surface markings commensurate with age and usage. This remains a very stylish and elegant retro teak chest of drawers which will continue to provide good service for many years to come. Attractive set of four vintage retro elm G Plan dining chairs. 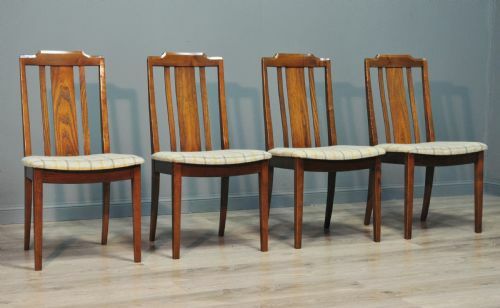 A lovely set of four vintage retro elm dining chairs from the G Plan range. We date these dining chairs to the second half of the 20th century. The chairs have G Plan labels underneath the seat pads. The chairs sit on two downward tapered legs at the front and two oblong section backwards splayed legs at the rear. The rear legs continue up with a slight backward curve to form the backrest side supports. The backrests each have three horizontal spars. The fixed seat pads are well padded. They are upholstered in a cream coloured heavy woven patterned fabric. This has been replaced at some recent point. The chairs are 35" (89cm) high with a backrest height of 19.5" (50cm), a seat height of 17.5" (44cm), a width of 19" (48cm) and a depth of 16.5" (42cm). This lovely set of vintage dining chairs remains in very good solid condition with only very minor surface markings commensurate with age and usage, including some minor indentations and wear to the finish. There are a few minor marks to some of the chair pads, primarily to one of them. This remains a very stylish and elegant set of dining chairs. They will continue to provide good service for many years to come. Attractive retro 1960/70's teak twin pedestal dressing table and stool. A lovely retro teak dressing table with stool. We date this dressing table to the 1960/70's. The table is fitted with a wide central mirror. The mirror glass is thick and is showing little signs of foxing. The body is of twin pedestal design, with each pedestal featuring three storage drawers. There is a further central kneehole drawer. The pedestal drawers are fitted with full length bar handles. The dressing table has a height of 47" (120cm) (including mirror) with a main table height of 27.5" (70cm), a width of 66.5" (169cm) and a depth of 16.5" (42cm). This lovely retro teak dressing table has been constructed to a high standard and remains in very good solid condition with only very minor surface markings commensurate with age and usage. The mirror sits a little closer to the dressing table to the left hand side and there is an old repair just under the right hand pedestal on the inside. 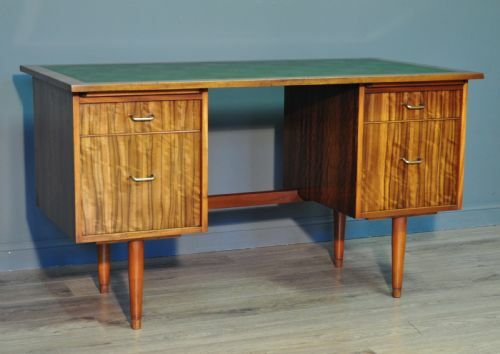 This remains a very stylish and elegant retro teak dressing table. It will continue to provide sterling service for many years to come. Attractive retro vintage mirrored back hall stand. A lovely vintage retro oak hall stand. We date this hall stand to around the 60/70s. The hall stand sits on a flat base which also houses the metal drip tray. The front has a left hand cupboard with an internal shelf. The rear is panelled. The rear panel houses an oblong mirror and is supplied with a total of three double pegs. The rear of the hallstand has a simulated wood vinyl covering. The very top of the hallstand has a brass spar shelf with further single hooks and the base shelf and cupboard top have marbled formica tops. 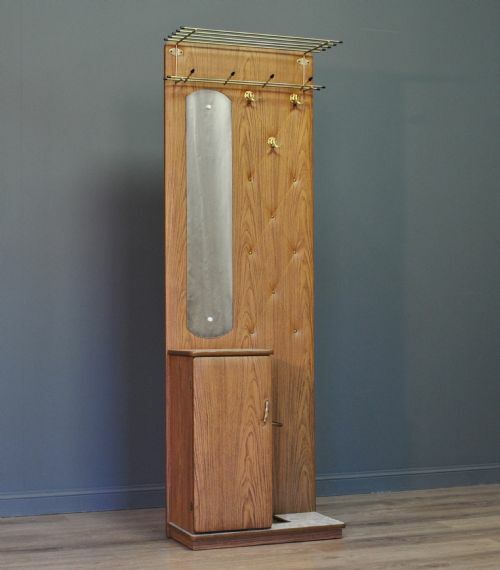 The hall stand has a height of 71.5" (182cm), a width of 23.5" (60cm) and a depth of 11.5" (29cm). This lovely vintage hall stand remains in good solid condition with only very minor surface markings commensurate with age and usage. The mirror is showing a little bit of foxing. This remains a very stylish and elegant hall stand which will continue to provide sterling service for many years to come. Attractive vintage satinwood panel back 36" single bed. A lovely vintage satinwood single bed. We date this bed to the 1960/70s. The bed comes in four sections, the head and foot boards, a divan base and the side rails. The head and foot boards sits on sturdy square section legs. The legs continue up to form the back supports for the main panel. 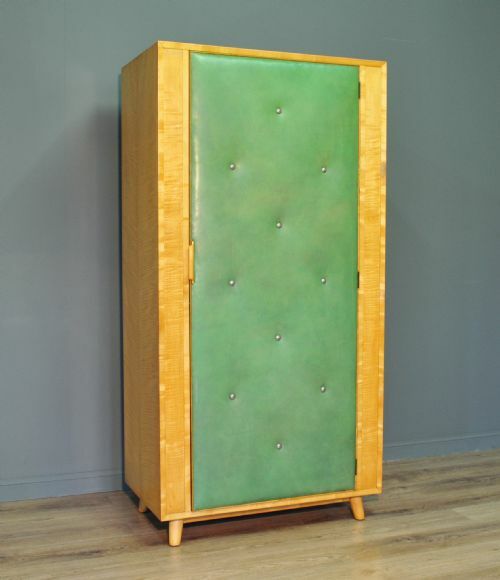 The head and footboard have been lined in a green leather with stud detail. The divan base sits directly onto the metal side rails. The headboard is 36" (92cm) high, the footboard is 27" (69cm) high both by 36" (92cm) wide. The bed will accommodate a mattress 75" (191cm) long by 36" (92cm) wide. This lovely vintage single bed remains in very good solid condition with only very minor surface markings commensurate with age and usage. 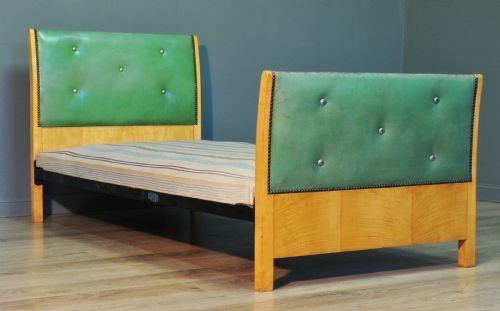 A stud is missing from each side of the footboard and the green leather is showing a bit of wear, primarily to the footboard. This remains a stylish and elegant vintage single bed which will continue to provide sweet repose for many years to come.